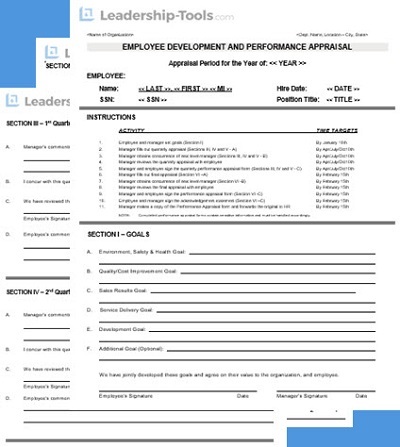 Included in our sample performance review template, is a section for goals and professional development. As the leader, you need to establish regular checkpoints to review the employee's progress to goal, and inspect that the agreed upon activities are being completed in a timely manner. It's imperative that the leader provide timely follow up. Setting a good example for all to follow will ensure that team members are ready for your questions, and they will be prepared to report on their progress. During the performance appraisal you should agree on specific action steps you will take to support the employee, as well as actions the employee will be responsible for. One of the questions leaders should ask is, "What do you need from me in order to be successful?" This question let's the employee know that you are invested in their success. It demonstrates that you are committed to helping them meet or exceed their goals and get the best results possible. When your people feel this way, it's a huge win for everyone! On the other hand, a lack of interest or follow up on the part of a supervisor puts leadership into question and your credibility at risk. At a minimum, it's a good idea to meet at least quarterly with each employee. Ideally, meeting monthly is even better. You can't over-communicate with your team members. Meeting regularly ensures the employee stays on track, stays informed, and will allow the employee/manager relationship to strengthen. Great leaders will use this time to support, encourage and mentor their employees. Employees will appreciate your concern and involvement in their professional growth. Make sure you maintain an "open door policy" as to encourage ongoing communication throughout the year. Stay focused on the achievement of the goals, but also remain flexible! As you proceed through the year, you may find it necessary, due to unexpected events, to revise goals up or down. If goal revisions do become necessary, make sure employees clearly understand why the change is needed. Inform them on why this decision is important to the company meeting its overall objectives, and explain how the change impacts the employee. Bottom line, engage and connect with your employees as much as possible. If you win their hearts, their results will improve exponentially. Employees need the same thing their leaders do. They need to go home at night with a sense of achievement. "Say what you mean, and mean what you say - but don't say it mean." As the leader, you should always assume that every night at the dinner table, your name comes up in the conversation. Now before you get too full of yourself, you need to understand that this may or may not be good thing. Have you ever considered what your employees are saying about you to their family and friends? Do they feel they can trust you? Do they feel as if you support their future aspirations? If you aren't sure what your employees are saying about you then the odds are great that you need to be investing more time in getting to know your people. This doesn't mean you should strive to development strong friendships with your employee outside of work hours. That too, would be inappropriate. Leaders should, however, work to develop strong connections with team members to ensure you understand what motivates the employee so you can determine how best to help them succeed. .
Use the performance appraisal process as one way to ensure open and constructive communication among all the members of your team. It’s worth your time and effort, and more importantly, as the leader you owe it to your employees to do all you can to help them to succeed. Okay, it's time to schedule those coaching sessions and performance reviews. Now that we've outlined how our sample performance review form can be leveraged, we encourage you to customize the form to best meet the needs of your industry, organization and team. This concludes our six part series on performance reviews... you did it! Thank you for completing this series on performance appraisals. We hope that you have found this short series informative and that you will use what you've learned to conduct thoughtful and meaningful coaching sessions and performance reviews with your team members. Remember, the sample performance review form that we have provided can be customized to your specific industry and team, so take the time to make the tool your own. Your people will thank you for it, and your overall results will improve as you increase the quality of your discussions. 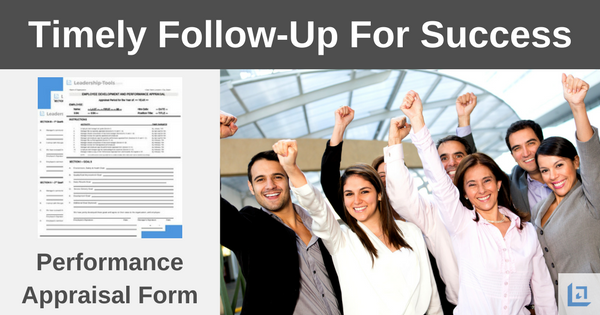 To download our free sample performance review template, simply subscribe to our free newsletter. You will immediately receive a password that grants access to our entire leadership tools library.